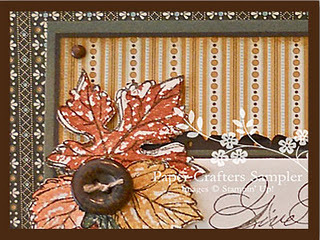 November is a time of year where many find themselves wanting to express a litle hand-made home, be it cooking or crafting. Our November issue, "Harvest Essence" offers a cornacopia of ideas. Projects include pretty packaging for gifting goodies, Thanksgiving table embellishes, cards and a very special kitchen apron for the cook. We encourage our subscribers to find time between hunting for your pumpkin pie recipe, to relax and reflect on giving Thanks.